On Monday, May 17, I went for my Pre-Admission Test in preparation for my upcoming discectomy, date TBD. My PA was a lovely young lady by the name of Angela, who had been on the job for about a month. She took my blood pressure (“Excellent!”), stethoscoped me (“Wow! Your lungs sound clean!”) and asked me the usual questions about my basic health: “Nausea? Dizziness? Alcohol use? Drug use? Depressed?” To this last, I responded that I was a little bit bummed because Lost was ending, but other than that, life is good. She asked me what type of surgery I was going to have, and when I told her, she waved it off as if I’d said I was going to have a splinter removed from my finger. I’ve gotten that response from just about every medical-type I’ve talked to, which eases my mind somewhat. 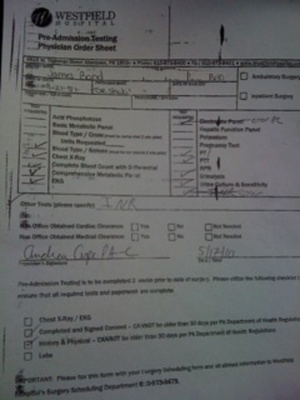 When Andrea was finished with me, I went over to the hospital building of the little compound, where they took four or five vials of blood, a few chest x-rays (why they took pictures of my chest when it’s my lower back that’s getting cut open is a mystery to me), a container of urine, and did an EKG. The end result, as far as I can determine, is that I’m healthy enough to go under the knife. Now all I need is a date and time. Updated: Just got a call from the Doc’s office. Surgery is scheduled for June 8. Updated: Got a call an hour later. The office girl said, “If there’s a cancellation, would you mind moving your surgery up?” I said, “To when?” She said, “Tomorrow.” Sorry, Misty. I need at least a couple of days notice if I’m going to have back surgery! ← What If I Fail The Test?